Almost 2 years ago I illustrated this Anthony Bourdain piece in the style of Shepard Fairey's Obama poster. (This was before that Obama online poster "generator" became popular). I managed to find the email address of Anthony Bourdain's assistant and subsequently emailed a jpeg of the image to her. I figured at minimum the illustration would get a good chuckle. Not surprisingly I never received a response. As time went on I began posting the illustration on Bourdain's fan pages on various online social networking sites. I also began emailing a hi-res, printable jpeg to anyone who asked. 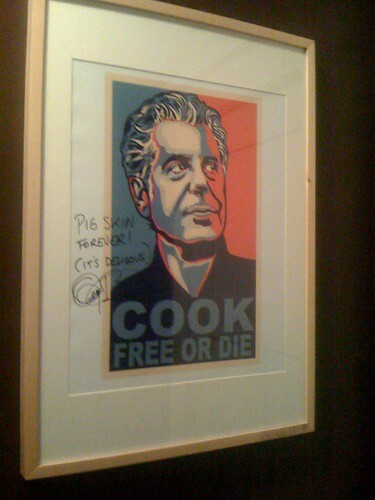 Consequently, one individual who requested the jpeg had his signed by Anthony Bourdain at a book signing. The individual said Anthony Bourdain chuckled when he saw it, saying he remembered seeing it a couple years ago. That individual was kind enough to send a photo of his signed art print.